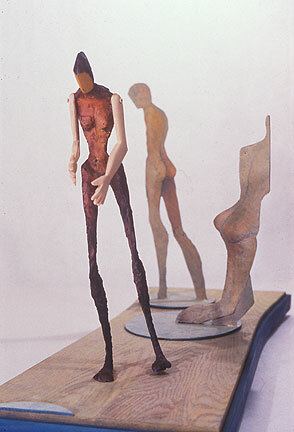 Painted bronze, steel and wood, 1991,12" x 30" x 18". Whether relationships erode from neglect, vanish over time and distance, or implode in crisis, my memories are peopled with what was, what could have been, and what never will be. Memories of severed relationships shift and change with the emotional weather of the day, causing my "memory vanes" to pivot, sometimes facing each other, sometimes moving apart, sometimes showing traces of shape and reality, other times flat and raw.